Robert Goddard in America , Sergei Korolev in the Soviet Union and Herman Oberth in Germany are three names credit with the development of rocket propulsion during the late 1920s and early 1930s. Each led a very small group with more dedication then resources working on a shoestring budget usually in their own time after work. Their collective work eventually lead to Sputnik, the space race and one of mankind’s greatest technological achievement – Apollo 11 mission to the Moon in 1969. During the inter war years, the northwest of England gave rise to organisations that nurtured the science of rockets and space travel. In 1933, Philip Cleater in Liverpool founded the British Interplanetary Society (BIS) to promote spaceflight, an institution which continues to exist to this day. 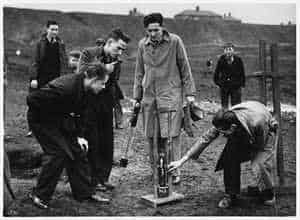 A little known group established in 1936, called the Manchester Interplanetary Society (MIS) shared the lofty idea of space travel and had the ambition and talent to design, build and test rockets that could help to realise it. The MIS founded by an ambitious and gifted sixteen year old Mancunian Eric Burgess in 1936. Initially, Burgess used his own home, 683 Aston New Road as the headquarters but moved to a founder member, Harry Turner’s house in Lonsdale Place not far Manchester City centre in the following year. Arthur C Clarke a member of both the science and sci-fi communities visited Harry in Manchester several times and promoted both. Most of the active members of the MIS received a summons to appear at the City Police Court on May 14. The charge against Harry Turner was that he “unlawfully did manufacture a certain explosive you not being allowed by section 4 and 39 of the Explosives Act, 1875 to do so“. Harry like most of the members was not eighteen so his father Henry is also named on the summons. In the event, Eric Burgess successfully argued that they were not manufacturing explosives but conducting rocket propulsion experiments. No one was found guilty. They agreed not to use Clayton Vale but another site in Glossop instead. After the war Eric Burgess emigrated to America and worked for NASA and the space industry. He wrote many books including one of the earliest dedicated to rocket propulsion. Perhaps Burgess’s most remarkable achievement is the least well known. Over dinner in November 1971 with Carl Sagan Burgess proposed that a message from humanity should accompany the Pioneer 10 destined for Jupiter in the following spring. Pioneer 10 would be the first man-made object to achieve solar system escape velocity and head in to interstellar space. The plaque was designed by Carl Sagan and Frank Drake and successfully incorporated in to the mission in a very short time. Although Burgess was informed about the plaque prior to launch, the image of a naked man and woman was so controversial in the 1970’s conservative America that NASA insisted on a news embargo until after launch. A plaque on display at the Smithsonian Institute in America recognises Eric Burgess’s contribution to space travel. 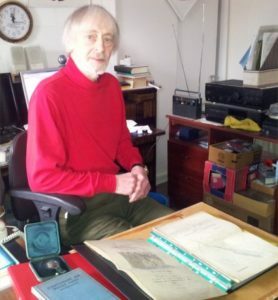 In Manchester there is nothing to mark the unique achievements of Eric Burgess, Harry Turner, Malcolm Wade and others who were Manchester’s very first rocket scientists. In this interview Philip Turner’s son, Philip talks about Harry but fist, Harry’s widow Marion on how she first met Harry.